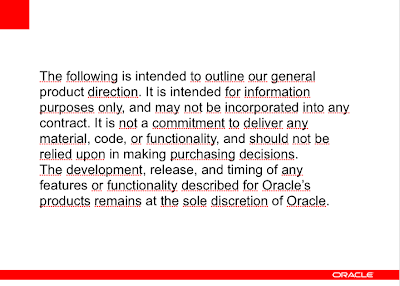 As I blogged yesterday, Mike Hichwa gave an insight in the future of Oracle Application Express. One of the things he showed were Oracle Websheets, the coolest thing I've ever seen and the next killer feature of APEX! 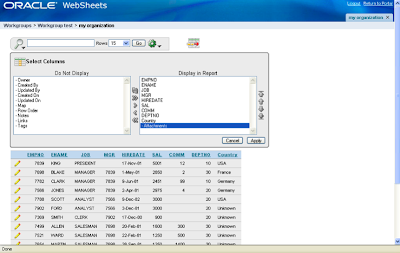 You can see Oracle Websheets as "Rocket APEX" or "RAD Extreme". 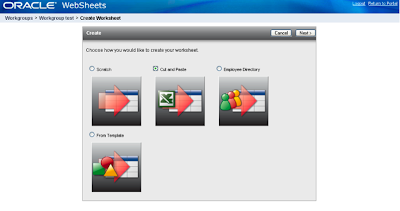 Websheets allow you to create a working application in no time. So it allows you to create applications in a very user friendly way. People can upload spreadsheets, extend it on the fly (even the underlaying data model for ex. 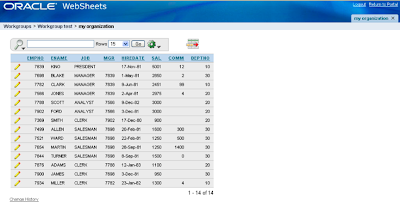 adding a column), get web 2.0 features out of the box etc. So it makes APEX even more useful for "non-programmers" and it takes the declarative approach to the next level! 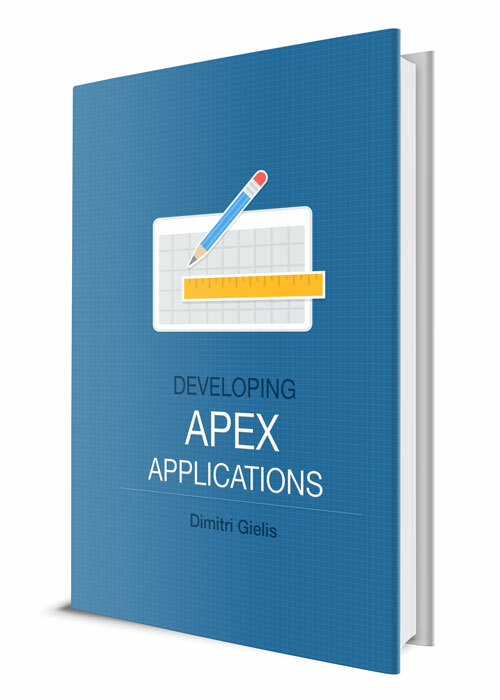 But that's not all, we APEX developers can also benefit from this nice piece of code as we would be able to reuse all the building blocks of websheets in our own applications or even just include a websheet in our APEX application. 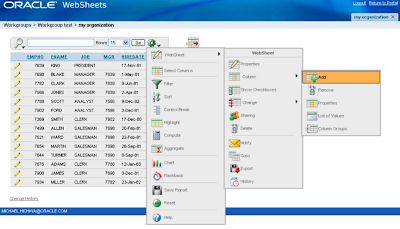 The best way to look at Websheets are Interactive Reports combines with tabular forms which you can edit, but with a side node it's completely web 2.0 and you've so much more features we have ever dreamed of. Of course I could write a lot more about it, but screen shots are so much more fun! 1. 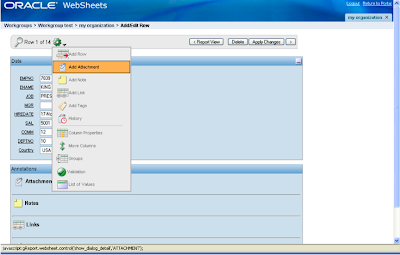 After you login in Websheets, you'll see a screen to create a websheet. 3. The wizards is really nice, after you copied it in the text box, you hit the submit button and bamm, there you go, your Oracle Websheets! 4. It looks like an Interactive Report in APEX, right? It's partially that, but I would like to see it as an "Interactive Report on Steroids"! 5. If you look at the "Wheel of Magic" you get so much more options than with Interactive Reports: add and remove columns, create LOVs, send notification mails, see the history of a record and much more. 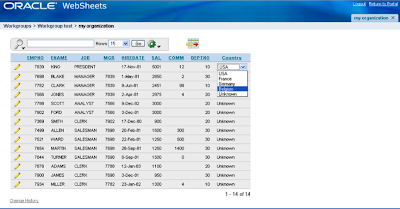 The below screenshot is to add a column Country, which exists out of a list of values. 7. 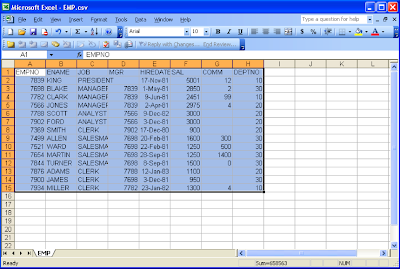 The result looks like this, an additional column which you can change directly by selecting another value from the lov. 8. If you click on the edit link you can do a lot more: adding attachments, notes, links and tags. 10. The result in the next screen. 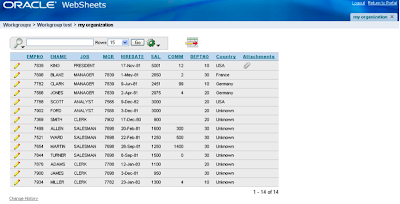 The Attachments column is included and you see that for a specific record there's an attachment. 11. And to keep the best for last... editing an Interactive Report, just like a tabular form! So what do you think about that? ... I just love it! Looks Amazing! Want it now!!! That is absolutely awesome. We need this now!! Woooow... this is something that should be available as soon as possible..
Or when it's available ? Really nice! I already can see how my users will love this feature! Im glad you posted this. When I got back from the conference the websheets "demo" was stuck in my head and I wanted to know more. Im sure hope to see this soon as is everyone else apparently. I'm glad you posted this too, since it's such a cool feature. I hadn't even seen Interactive Reports demoed live before ODTUG, so was totally blown away by that! As you said, Websheets is Interactive Reports on Steroids. OMG have you looked at the list of options on the Websheets extention to the "Wheel of Magic"? Share??? Notify??? Those would truly be magic! On the other hand, one of the things I think is great about the V3.1 Interactive Reports is that the developer can disable some of the "Wheel of Magic" features for an application for an audience that might not be that technically savvy. Hopefully they'll let you do this conditionally on WebSheets! Woohoo!!! Remember, this is a very early version... so things might not be in, but it looks very *very* promising! The Apex Dev team did a great job. This is real nice, thanks for announcing it. What also would be nice if you could download the websheet as a real Excelsheet again (xls, so not csv). 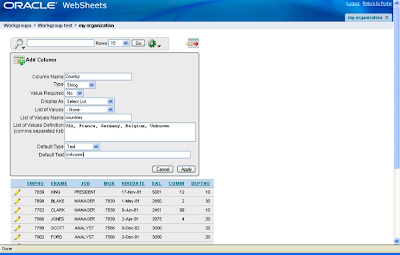 Any information on the time frame when the websheets will be available will be useful. We are in need of it. Oracle Application Express at OOW - Vote now! 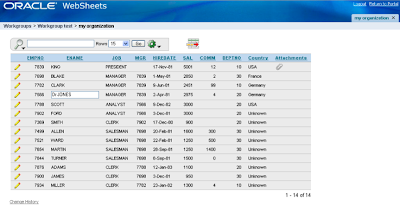 Using Subversion in SQL Developer... Easy?